Our 2017 Road Trip, Part 21: Visionary Mementos « Midlife Crisis Crossover! 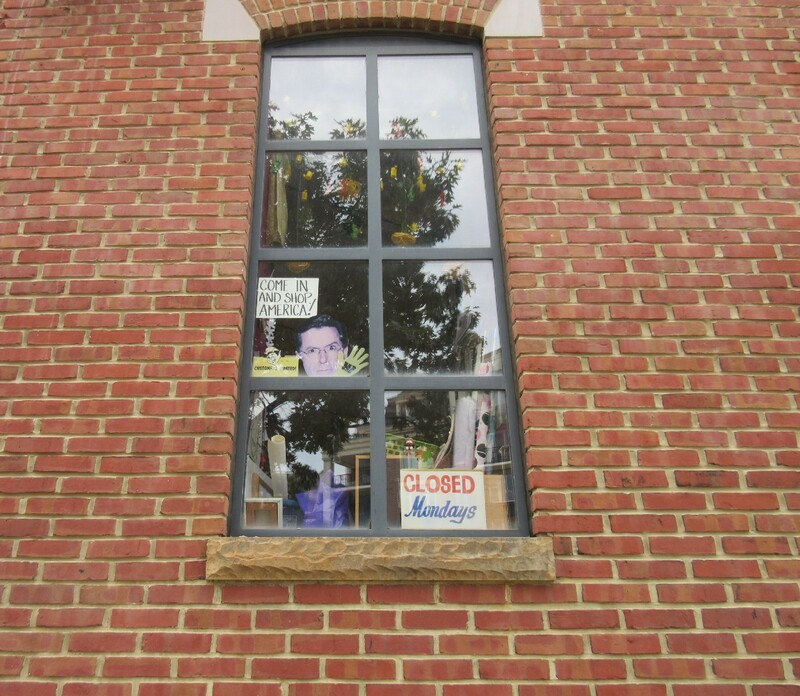 Even as we approached the AVAM from the Inner Harbor and walked toward the wrong side, we could tell inside lay a smorgasbord of Something Different from their window dressings alone. 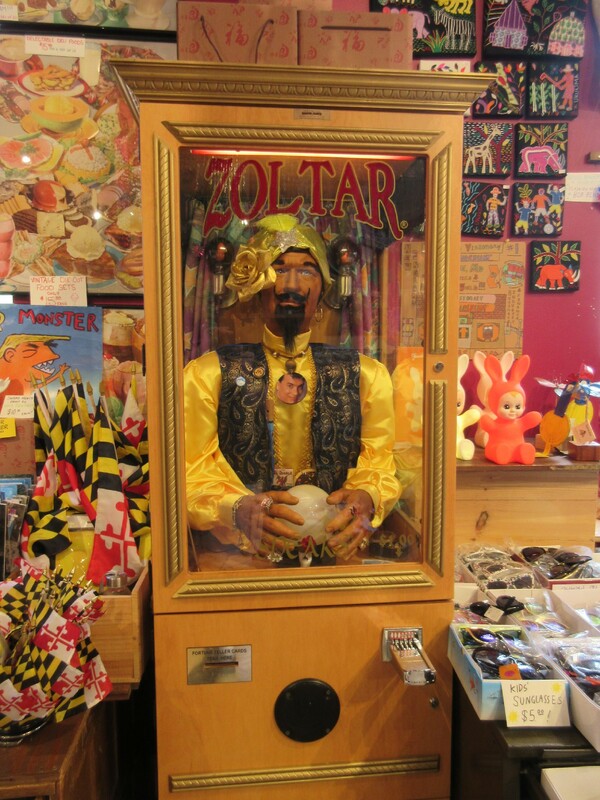 The disembodied head of Stephen Colbert welcomes you to one of the hundreds of Baltimore attractions closed Mondays! Hence our Tuesday tour. Remember that time when Americans were so worried about the future that they spent money on desperate 1-900 calls to psychic hotlines? Now you can own the home game! 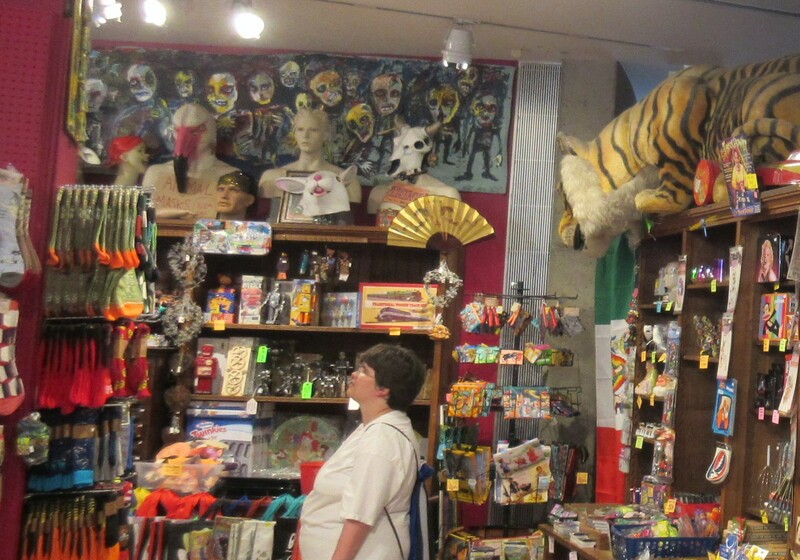 Welcome to Sideshow, the AVAM’s unique souvenir stand. Most museums let you buy geodes, stuffed zoo animals, dinosaur fossil kits, cheap chemistry sets, nature-sound CDs, and $75 coffee-table hardcovers. Sideshow isn’t them. 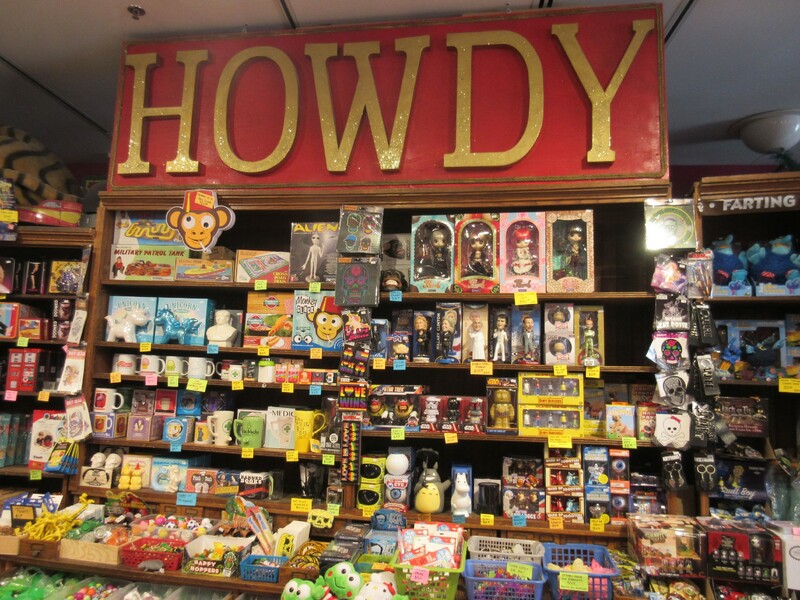 Sideshow is loaded with endless samples of outsider art, and immersed in the wondrous worlds of camp, kitsch, pop culture, geek merch, and other kaleidoscopic esoterica beyond my skill set to enumerate. 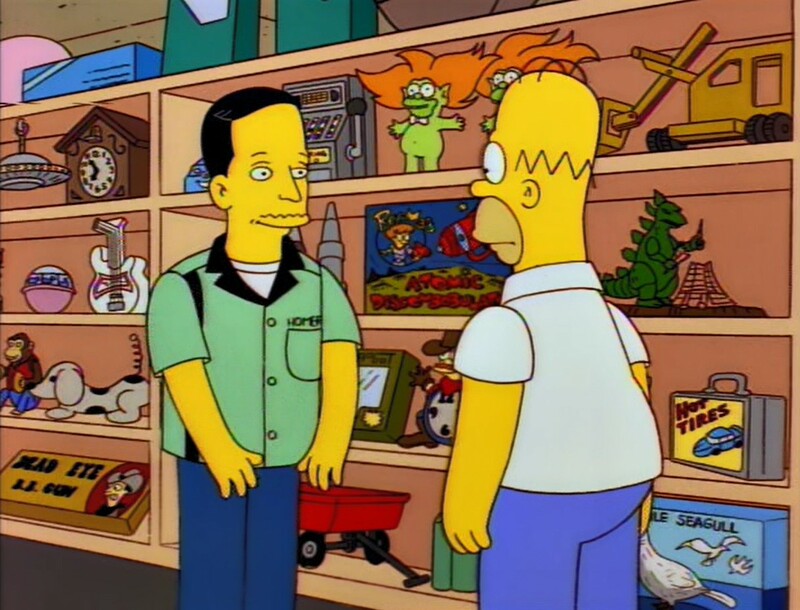 The best way to describe it: if you remember the time Baltimore native John Waters guest-starred on The Simpsons as the owner of a a wacky shop called Cockamamie’s, filled with curios and collectibles, Sideshow is Cockamamie’s brought to life in vibrant, interactive 3-D.
From the season 8 episode “Homer’s Phobia”. HOMER: …look at what you’re selling! Fifty bucks for a toy? No kid is worth that! JOHN: Ah, but this is the Rex Mars Atomic Discombobulator! Don’t you just love the graphics on this box? HOMER: No. How can you love a box or a toy or graphics? You’re a grown man. JOHN: The tragically ludicrous? The ludicrously tragic? HOMER: Oh, yeah, like when a clown dies. 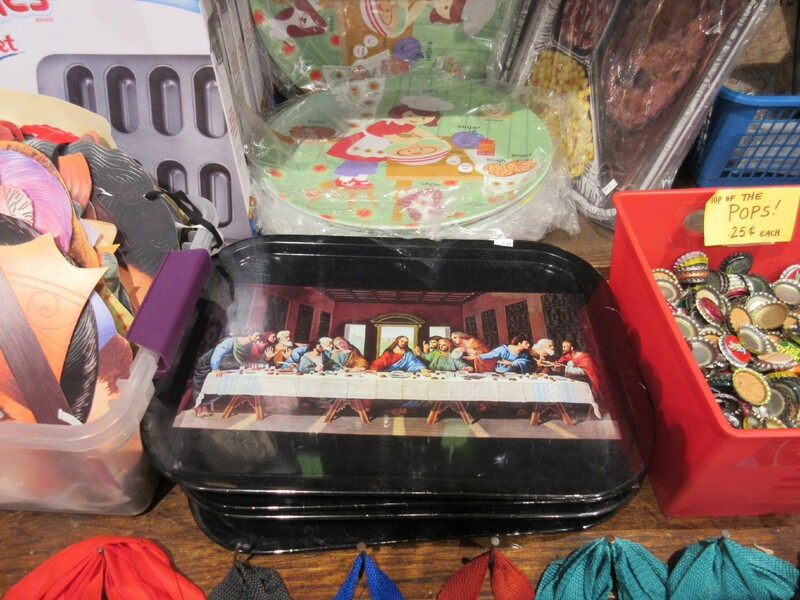 JOHN: Well, sort of, but I mean more like inflatable furniture or “Last Supper” TV trays. Or even this bowling shirt! Can you believe somebody gave this to Goodwill? As he spoke it, thus has Sideshow embraced it. This functional keepsake can be yours for a lot less than 30 coins of silver! So. Many. FIGURINES. 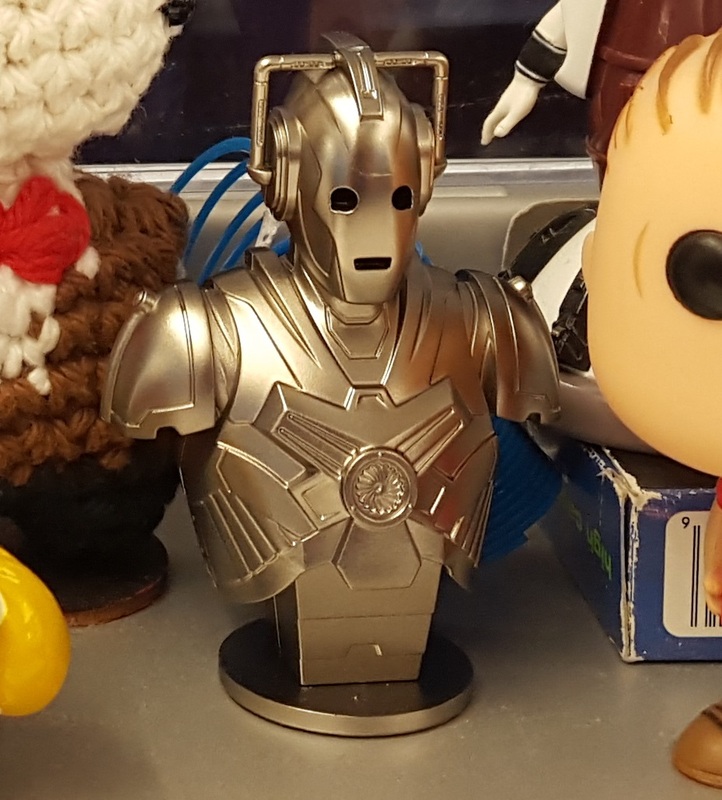 And none of them were Funko Pops. There ARE other figure manufacturers out there, kids. 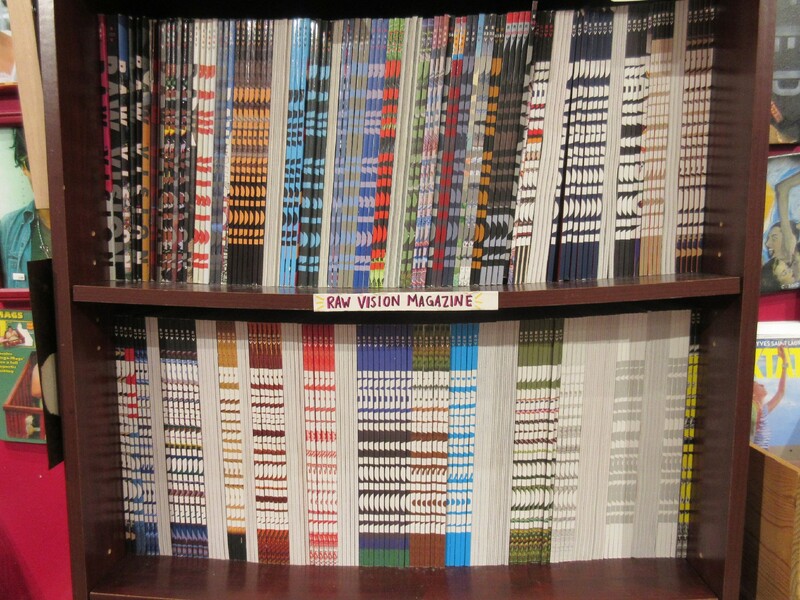 As a comics fan I was floored by the sight of what I thought was the largest collection of Spiegelman and Mouly’s RAW Magazine, but in fact this is Raw Vision, a totally different magazine. But still: funky art mags! Anne, not even knowing where to begin. At a convention this would be ten times more expensive and it probably wouldn’t have been a road trip souvenir. 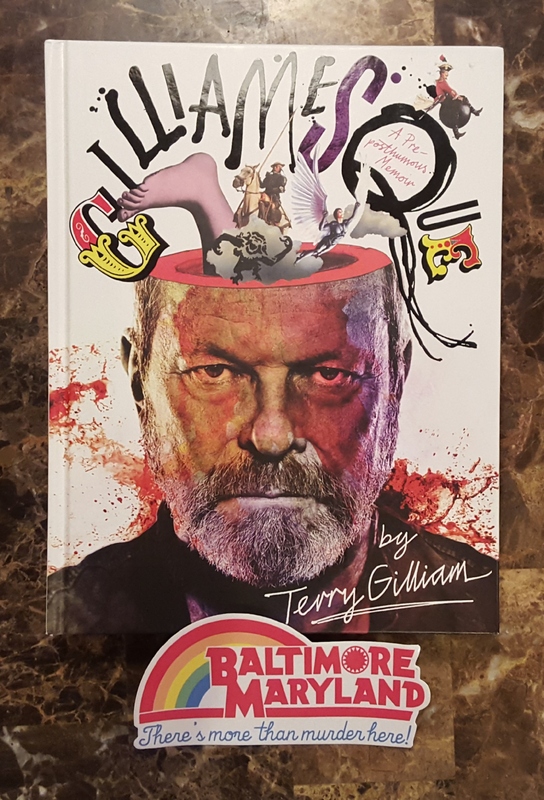 …and a thick hardcover book that Anne and I took turns carrying over the next several hours: a discount copy of Gilliamesque: A Pre-Posthumous Memoir — the autobiography of Terry Gilliam, the visionary film director and Monty Python alum. It would prove a candid, fascinating read from the perspective of a renowned creator frequently at odds with the Hollywood entertainment system throughout much of his career. By late afternoon it felt like a 200-pound tell-all. I regretted only the mass, not the matter. Anne, thinking differently, bought only a sticker. But it was the best, most forthright Baltimore sticker she could find in town. Both were apropos of the American Visionary Art experience. If Gilliam had ever directed an episode of Homicide: Life on the Street, I like to imagine “Baltimore: There’s More Than Murder Here!” would’ve been a direct, sarcastic quote from it.